The American Society of Agronomy (ASA), Crop Science Society of America (CSSA) and Soil Science Society of America (SSSA) have named the recipients of the 2019 ASA, CSSA, and SSSA Future Leaders in Science Award. Tania D. Burgos Hernández from The Ohio State University is one of 18 graduate student members who received the award in recognition of her interest and engagement in science advocacy. Tania accepted the award at a reception held during the annual ASA, CSSA, & SSSA Congressional Visits Day on March 4, 2019 in Washington, D.C.
Tania is a fourth year Ph.D. candidate in the School of Environment and Natural Resources in Ohio State’s College of Food, Agricultural, and Environmental Sciences (CFAES). She is in the soil science specialization focusing on numerical classification and mapping of highly disturbed soils in an urban area and quantifying the variability of C stocks under different urban land covers under the direction of Dr. Brian K. Slater. Tania received her B.S. in Agronomy (2012) from the University of Puerto Rico, Mayagüez and her M.S. in Soil Science (2015) from The Ohio State University. 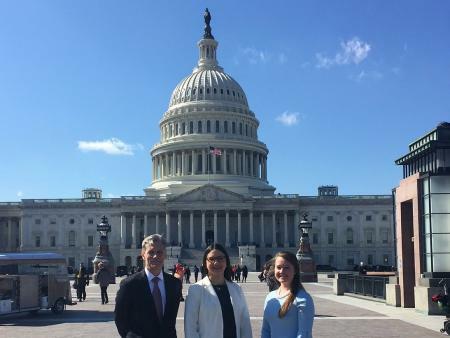 As a Future Leader in Science Award winner, Tania participated in the annual ASA, CSSA, and SSSA Congressional Visits Day on March 5 in Washington, DC, where she and other graduate student members met with their members of Congress and advocated for food, agriculture and natural resources research. ASA, CSSA. and SSSA are scientific societies based in Madison, WI, helping their 10,000+ members advance the disciplines and practices of agronomy, crop, soil sciences, and related disciplines by supporting professional growth and science policy initiatives, and by providing quality, research-based publications and a variety of member services.